Are Wine Releases Like a Fox Hunt or Horse Race? Every year it happens: Here at Cave B Estate Winery we prepare…once in the spring, and once in the summer…to release the wines. Every spring presents the end of a tremendous period of becoming for the white wines. They have been harvested, crushed, put in barrels or tanks, ever so carefully watched and nurtured; added to or carefully left alone, crafted and brought along…all within the confines of the estate winery; dynamic and ever-changing, but contained. But finally some of those wines have become just that, and they are ready to be removed; to be funnelled out of their containment and brought into the light, allowed to breathe, be seen, be tasted and felt on the tongue, in the throat. Their journey to this point is finished; the rest of their life just beginning. Why are wines released? Because they cannot be held back any longer, or they will become something entirely other than what they have become at precisely that moment. They leave the domain of the winery and winemaker with purposeful timing, yet with that great sense of hope–ribbed with confidence, lined with unknowing, shaded with total abandon–that there will be people there on the receiving end of their release, ready to catch them up on the palate and experience through taste and nose and feel their entire life to date. Release and catch…. Winemaking–it’s a horse before the cart art. A grand risk. A tremendous rush. Cave B Estate Winery’s Spring White Wine Release: Saturday, March 28, 2009. Come experience the release of the whites. Be there to catch them. Mark Pickerel Comes Again to The Cellar! Have You Been? Have you come to a Live! 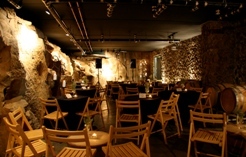 at The Cellar performance yet? Have you parked in the upper parking lot, walked along the winding gravel path above the Spa and Chef’s garden, rising higher until you reach the giant doors of the old tasting room? Have you laughed and talked with your friends while you continued on toward the giant Roundhouse just down the path, your breath making frosty puffs before you in the cold night air? Have you burst into the tasting room like an exploding party favor–all high spirits and noise–and laughed and talked your way as you rubbed your arms briskly and move–immediately and happily–toward the tasting room bar? Have you had the pleasure of chatting up Winemaker Freddy Arredondo or tasting room extraordinaire Joe France while they pour you a glass of deep red Cave B Wine or white wine so clear and crisp it’s like winter in a glass? Have you caught a glimpse of the performers as they linger in the back hall, or had the pleasure of realizing they are the very person you’re casually chatting with while you take your first sip and place your order for your oh-so-perfect BBQ slider? Have you moved with anticipation through the doorway from tasting room to The Cellar and stopped, struck and amazed, when you see the tremendous basalt boulder wall, the musician’s instruments and microphone, the perfect overhead performer lights, the flickering candles around the room, casting the lively faces of the crowd inside into rosy high relief? 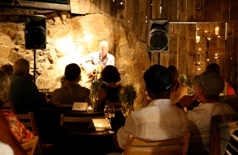 Have you stood at the back of the rock-lined room, your glass of SageCliffe 100 red or Cave B Cabernet hovering between your mouth and the wine-barrel bistro tabletop, as you’re too engrossed in conversation and listening to the performer to remember you’re holding it? Or have you moved to the front of the room, where there are pillows on the floor, tables with chairs, a bench, a barrel–all mere feet from the performers–so you can sit and sip, hearing every lyric and note, fully engaged, totally appreciative of this person there before you, singing their heart and soul out on this cold night to this merry band of travellers? Were you there last October, when Ellensburg native Mark Pickerel picked up his guitar and took possession of the mic, the room, and everyone’s heart? Have you heard his words, his urban country twang, his rockabilly sensibility? Have you made plans for 8:30 p.m., Friday, February 13? Have you figured out how to get out of them so you can come experience Mark Pickerel’s return to The Cellar at precisely that time? Have you? Yeah! Its an Ice Wine!!!!! Yes everyone, Mother Nature graced us with some COLD! COLD! COLD! days in the middle of December. On December 16th 2008, with temperatures in the single digits, we had those much-needed cold temperatures required to freeze an intensely sugar-filled grape on the vine. With a temperature of 6˚ F at the onset of the Ice Wine harvest, the chilly thermal reading refused to break into the double digits. So with hats, gloves, facemasks and heavy coats donned and all body parts carefully covered except for their eyes, our hard working harvest crew braved the freezing temperatures to bring in the harvest for our 2008 Cave B Ice Wine. The fruit was beautiful, and eating these frozen grapes was much like having a tiny spoonful of a delightful Semillon Sorbet. A final sugar reading in the juice of 39.5 degrees Brix assures that this Ice Wine can achieve a perfect balance of alcohol to residual sugar. Thank you, weather…hello, Ice Wine.